From gear pumps to plunger pumps Dynasoft has you covered. 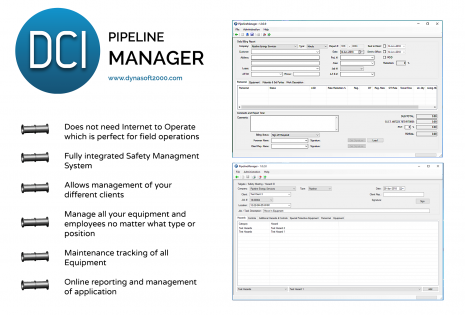 This application design allows mechanical service companies to manage and track a full array of equipment they service. 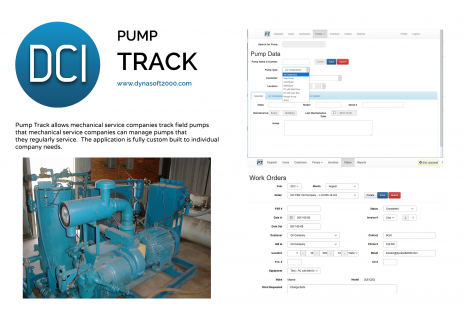 This application was developed to Manage, Track, Dispatch, and set Preventative Maintenance Schedules for pumps. The application allows quick dispatch as well as booking those jobs on an interactive calendar. The jobs can be scheduled on the calendar as well as assign those jobs to a technician who will get notified of the pending job via text or email. This application also contains an Inventory List module to allow the user to add inventory items to keep charges to the Work Orders easy and accurate.